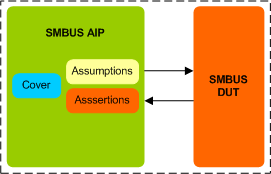 SMBUS Assertion IP provides an efficient and smart way to verify the SMBUS designs quickly without a testbench. The SmartDV's SMBUS Assertion IP is fully compliant with standard SMBUS Specification. Supports SMBus specification version 3.0. Supports all the SMBus commands as per the specs. Support ARP command generation and response. Support Timeout detection and generation. Supports Simulation mode (stimulus from SmartDV SMBUS VIP) and Formal mode (stimulus from Formal tool). Rich set of parameters to configure SMBUS AIP functionality. SmartDV's SMBUS Assertion env contains following.